Chrome messenger bags have been crashed, smashed, and trashed by couriers worldwide for several simple reasons. Chrome messenger bags are constructed with the most rugged assembly of industrial materials and hardware available: military spec. seam binding, 1000d Cordura shell, 18 oz. PVC truck tarp liner, and nylon 69 thread. It's like a bag within a bag. The independently suspended PVC liner freely floats within the outer shell eliminating seams exposed to the outside elements. Your cargo is safe from rain, snow, mud, and most anything else this cruel world can sling at you. Chrome messenger bags are designed with an anatomically correct EVA foam padded shoulder strap and cross chest load stabilizer. The quick release seat-buckle closure allows for on-the-fly one-handed tightening and loosening of the shoulder strap. 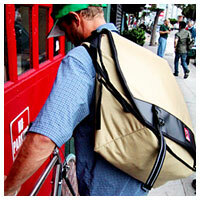 The ideal bag for heavy-duty messenger work. In addition to the cross-chest stabilizer strap, the Kremlin messenger bag also includes a waist strap attachment point. Extra features include a secret stash pocket and front utility buckles for external rain gear storage. 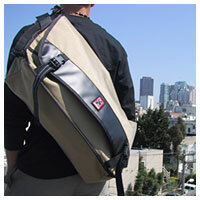 A simple accessory Laptop Sleeve transports your laptop safely in any bag. Velcro closure and front slit pocket. Fits most wide format laptops including the 15" PowerBook. Dimensions: 15" x 10" x 2.5"
The standard Kremlin is designed to be worn on the left shoulder. A limited number of colors are also available in a right shoulder version. Slightly smaller and nimbler than the Kremlin messenger, but still plenty big to carry a lot of what you really need. In addition to the cross-chest stabilizer strap, the Metropolis also includes a waist strap attachment point. Extra features include a secret stash pocket and front utility buckles for external rain gear storage. The standard Metropolis is designed to be worn on the left shoulder. A limited number of colors are also available in a right shoulder version. MadsonLine's Generation Gap allows both MadsonLine Adapters and Apple AC Adapters for pre-2001 PowerBooks and iBooks to work with the PowerBook G4 and iBook (Dual USB). Unsupported product on other 3rd Party Adapters. Compatibility Note Regarding PowerBook G4 15" (867 MHz, 1 GHz) & 17"
MadsonLine does not recommend using a 45W adapter ("Generation Gap") solution with the PowerBook G4 15" (867 MHz, 1 GHz) & 17". These PowerBooks will run off the adapter but may not charge the battery at the same time. During heavy usage, the PowerBook will draw from the battery while connected to the adapter. They will charge normally in a sleeping or shutdown state. As noted in the preceding item, users of the new aluminum PowerBooks are advised not to use older 45W power adapters. which may burn out from the higher power demand of the later machines. However, the new 65W power supplies will work fine with older PowerBooks and iBooks. The 15-inch PowerBook G4 is designed to use the 65 W Apple Portable Power Adapter which ships with it. A 45 W Apple portable power adapter works with the 15-inch PowerBook G4, but may provide insufficient power during some activities and power may be drawn temporarily from the battery. Therefore a 45 W power adapter is not recommended. Easy to install and use, the Whip antenna provides additional signal-grabbing power to reach out in wall-filled office environments. Also ideal when you are just out of the normal range of your AirPort network. Say good-bye to dropped links and to flaky connections when your PowerBook is equipped with the QuickerTek Whip wireless antenna. This external antenna connects with Velcro™, so there are no permanent modifications to your beautiful PowerBook case. And the antenna is easily repositioned to adapt to any wireless situation. Don't let its small size fool you, this little antenna offers amazing range. Apple Titanium PowerBook G4 owners get up to double the wireless network range. Easy to install and to use. This new antenna provides up to double the range of the standard Airport card and internal antenna(s) in the Apple PowerBook Pismo and Titanium G4s. By simply attaching the new antenna cable to the stock Apple Airport card and then connecting the external Stub antenna, you're ready for way-better reception, signal strength and reliability. The Stub antenna detaches for easy transport in your backpack or briefcase. When you need the maximum wireless range possible, this Whip antenna delivers. Small yet powerful. Got signal? Does five times the normal Airport wireless network range sound good to you? Complete your wireless network upgrade with an Airport Base Station upgrade. Now available as a user installable kit. Works with the Snow and with both versions of Extreme Base Stations. An illustrated installation guide makes installation a breeze. The Antenna Kit even works on base stations that normally don't accept external antennas. MacWireless.com announces a new line of 802.11g products. MacWireless now offers 802.11g CardBus and PCI solutions. Speed up your notebook or desktop computer and still talk to 802.11b networks. Supports AppleTalk, TCP/IP, and other network protocols. IEEE 802.11b/g WiFi Compliant. Works with Apple AirPort Base Stations, including Extreme as well as other 802.11b/g Access Points. Works with all PowerBook computers and machines with a PCI slot, running OS X 10.2.4 and higher, Windows 98 (SE) ME, 2000, and XP notebook systems. 54 Mbps max performance up to 150 feet. MacWireless now offers a new line of antennas for the AirPort Extreme base stations and Classic (Snow or Graphite) base stations and 802.11b AirPort cards. 8 different styles to suit your needs. Choose either Omni or Directional and the range from 3.5 dBi to as high at 14 dBi. Extend the range of your AirPort card or base station with a simple antenna, no software required, no configuration. In addition to the domestic version, MacWireless now offers the POE Extreme for our International customers. This exciting new product allows mounting your AirPort Extreme base station where there may be no electric power outlet, up to 100 meters away. No software involved. If you've ever had a dropped connection or found yourself just outside of your AirPort coverage area, here's the solution for you. MacWireless announces The Outdoor Box and The Complete Outdoor Solution. The Outdoor Box is ideal for protecting your base station from the weather or indoors from dust. There are several configurations available to fit your network needs. The Complete Box makes it simple because it contains an 802.11g (54 Mbps) access point, a built-in 15 dBi directional antenna and the Power Over Ethernet (POE) circuitry. MacWireless offers a full product line of 802.11b and 802.11g including PC Card,CardBus, PCI, and USB. Also, Bluetooth, POE (Power Over Ethernet), antennas, outdoor solutions, and wireless accessories. MacWireless products cover virtually all Macintosh models new or old. If you have an older PowerBook 190, 5300, 2400 or the newest Titanium, a desktop PCI system, or a machine with a USB port such as an iMac, MacWireless offers you a wireless network connection. What's more, all of our products are dual-platform, so our Mac users can use any of our products on their PCs as well. "Shipments of 15-inch notebooks may account for over half of the global market as early as the fourth quarter, after surpassing 14.1-inch shipments in the second quarter, according to estimates by Taiwanese notebook makers. "Shipments of 15-inch notebooks are rising rapidly due to a reduced gap in 14.1 and 15-inch panel costs. The price gap has fallen to US$10-US$15 recently, and may further drop to below US$10 next year, according to industry sources." 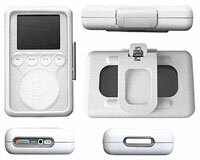 Now you can connect you Desktop Mac or PowerBook/iBooks without built-in infrared ports to IrDA cellphones, PDAs, etc. Uses the built in drivers in OS X - no need to install driver software. Contour Design have announced their new Contour Showcase for iPod. The Contour Showcase offers solid protection while letting users enjoy everything they love about their iPods - elegant design, slim dimensions, and ultimate portability. Through the skillful application of advanced dual-injection molding technology, Contour Design has created a case with a clean, trim, seamless look that highlights the pure beauty of the iPod. Contour believes that no other case on the market looks and feels so much like a natural extension of the iPod itself. The Show case will be available directly from Contour Design, starting Monday October 20, 2003. It carries a suggested retail price of $39.95. MacMice has released its line of aluminum and acrylic control decks for holding multiple PowerMate USB controllers. With the release of its new beta software for the PowerMate, Griffin Technology has enabled users to attach up to five separate PowerMate USB controllers to their Mac. The MacMice MateDeck is a desktop holder system created to hold and organize multiple PowerMates, in arrays of from two to five units. The MateDeck is made from 5052 aluminum and Acrylite brand acrylic sheet and is available in a clear anodized or black anodized finish to match either of the available PowerMate finishes. The MateDeck is fully described and available for purchase from the MacMice Workspace Products Co. web site, and is priced starting at $39.99. "Sharp has begun shipping its Mebius RD3D notebook in the US under the Actius brand name. The laptop, announced in September, incorporates two 15 in LCD panels, one mounted behind the other, to create a true 3D display system. "Sharp has also included collection of 3D movie trailers. Apparently, you can buy the feature-length versions on DVD-ROM, offered in Dynamic Digital Depth's proprietary 2D Compatible 3D TriDef format. But don't expect any major-league titles - certainly Sharp nor DDD can list any. "Available immediately, the Actius RD3D sells for around $3299." 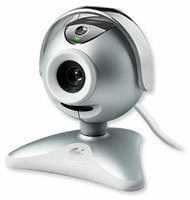 Bring your instant messages - and your drab desktop - to life with the stunning silver QuickCam Zoom. With just one click, you can add live video to your instant messages and share a smile with anyone, anywhere in the world. Thanks to the digital zoom and the automatic face-tracking technology, you can capture your special moments with more clarity and ease. You can also conduct video calls and conferences and say what's on your mind with live audio using the built-in microphone. The QuickCam Zoom sells for $79.95.